Folder Lock is a fast data encryption and password protection software for Windows. It can simultaneously encrypt, lock and password protect your files, folders, drives, USB drives and even CD/DVD-RW. Folder Lock creates encrypted storages called 'Lockers'. You can keep as many of your private files & folders in your Locker and password protect them with a single click. You can transfer, secure and backup these Lockers. These Lockers are portable, you can keep them in USB Flash Drives, CD/DVD (R-RW), & notebooks or transfer them via email or upload. Lockers are even undeletable on the computer where Folder Lock is installed. You can treat Lockers just as you would treat them in physical world. Each user can have their own Locker. However, a single user can create multiple Lockers with different passwords as well. With Folder Lock, you can choose either to encrypt using 256-bit AES on-the-fly encryption or lock files, folders and drives anywhere on your computer. Each Locker can contain your encrypted files as well as your personal list of locked items. Furthermore, Folder Lock's options like hack attempt monitoring, stealth mode, data shredding, history cleaning and auto protection can enhance data security beyond anything ever achieved. In addition, a locker's delete, move and rename are password protected to prevent data loss. 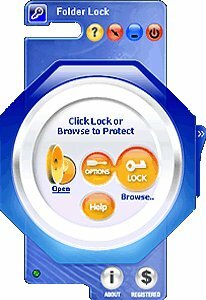 Folder Lock is Windows Vista / 2003 / XP / 2000 compatible and is the most downloaded File Security program in the market today.